Welcome to The TV MegaSite's 24 Site! Juma and his men continue to drill underwater. Olivia wants to go see her father in the hospital. 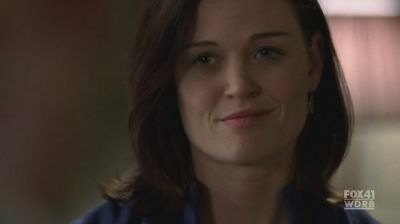 Agent Pierce says that Allison wants to speak to her daughter. Kanin updates Olivia on what’s going on. Kanin advises Olivia that she is safest in the White House. Kanin says he plans on going to the Pentagon. The President and her Press Secretary talk about making a statement to the press. Larry calls the President. Larry says that Juma is in D.C. Allison is shocked. Larry says that he can’t get a hold of Agent Walker. Renee is running from Dubaku’s son. A cop runs into Renee. Renee tells him to call Larry Moss. Dubaku’s son shoots the police officer. Bill checks on Jack in his holding cell. Bill says that Renee identified Juma as being in D.C. Jack wants to interrogate Burnett, but Bill says it’s not possible. Jack is outraged that Bill won’t do anything. Juma and his men make their way under the White House. Juma uses his walkie-talkie to talk to a man already inside the building. The man moves some lockers, exposing a hole in the wall. The man is able to hack into the security system. Juma and his men break through the wall. Another man uses a laptop to track the President’s movements. Juma instructs his team to follow him. There is an ambush. Some agents are shot. Juma tells his men that they have nine minutes to find the President. Some more men are shot. Juma shoots at the Press Secretary. Renee finds Dubaku’s son. Renee says that Juma had his father killed. Dubaku’s son doesn’t believe Renee. Dubaku’s son starts to strangle Renee, but he gets shot from behind. Renee tells Larry that she knows where the target is located. Jack is being escorted out of the holding area. Larry calls Bill. Larry says that the White House is the target. Bill alerts everyone that there is a code red. A man tells Allison that she needs to go to lockdown. Agent Pierce instructs Olivia to follow him to lockdown. Jack tells the President that she needs his help. Allison takes off the tracking device and gives it to Buchanan. Juma is told that the President has left the Oval Office. Juma finds Bill. Juma says that they need Buchanan as a hostage. There is another shootout. Juma’s men take some more hostages. The President is being led to lockdown. Allison says that Jack can’t seal the door because of Olivia. There is more shooting. Jack asks the President if she is okay. Agent Pierce is unable to get Olivia to lockdown. Juma shoots at the lockdown door, but is unable to get in. Juma says that they need reinforcements. Juma and his men are watching the feeds. Juma says via walkie-talkie that he has the President. He asks all the agents to leave the White House. The agents pull back. Juma orders his men to gather all the hostages together and lock down all the exits. Agent Pierce and Olivia hide. Pierce says that Juma was bluffing. He says that they need to find the other agents. The hostages are ordered to get down. One of Juma’s men is trying to figure out the access codes for the lockdown room. Larry has an area set up outside the White House. An agent says that they had to comply with Juma’s orders to leave the building. Larry says the Vice President needs to be notified. Larry tells Renee that Jack had plans to interrogate Burnett. Allison is watching the feed from a camera where the hostages are being held. Olivia isn’t with the group of hostages. Jack says that Juma got help from someone on the inside. Jack realizes that someone is trying to access the codes for the lockdown room. Jack is able to disarm the mechanism and turn off the access codes. A man alerts Juma that he is unable to get into the lockdown room. Juma says that they need to find another way in. Jonas Hodges gets a phone call from Juma. Juma updates him on the situation. Hodges reminds him that they had a deal. Juma threatens that he will destroy the shipment being sent to Hodges. Hodges divulges that President Taylor’s daughter is in the White House. Juma says the shipment will be sent as planned. Senator Mayer asks Bill what is going on, but Bill remains silent. Agent Pierce and Olivia slowly walk through the hall. Pierce says they need to get a signal out. Olivia says that she is going with him. Larry speaks to the Vice President. Larry says that Allison probably got to lockdown. Larry wants to get the okay for a rescue operation. The Vice President asks for more Intel before he’ll authorize anything. Pierce shoots one of Juma’s men, but ends up getting shot himself. Pierce tells Olivia it is up to her to get a signal out. He writes a Morse code on her hand. Olivia finds an emergency kit with a flashlight inside. She tries to alert the agents, but is taken hostage by one of Juma’s men. Aaron is taken hostage, as well. Hodges watches a news broadcast about the situation at the White House. Juma finds the camera in the hostage area. Juma puts a chair directly below the camera. Juma knows that the President is watching. Juma reveals that Olivia has been found. Juma instructs the President to leave the lockdown. Juma threatens to kill Olivia. Olivia is terrified. The President instructs Jack to open the door. He refuses, but Allison maintains that she won’t let Juma kill her daughter. Jack and Allison leave the lockdown room. Allison asks what Juma wants. Juma slaps her and says he’s running the show now. Juma tells the President that she will be making a statement, which could very well be her last.